The risk-off clouds that darkened global markets in the fourth quarter of 2018 rapidly dissipated in the first three months of 2019, as strong returns were generated across nearly every major asset class and category, particularly in January. Supporting the rebound was the anticipation of favorable Chinese-related developments, including the prospect for fresh rounds of fiscal stimulus, as well as progress on trade relations with the United States. Financial assets found an additional pillar of support in the way of mounting efforts by key global central banks, notably the Federal Reserve (Fed) and European Central Bank (ECB), which laid the groundwork for a more accommodative than expected near-term policy path. These tailwinds more than offset certain global macroeconomic concerns, including growing inversions along the U.S. Treasury yield curve and a meaningful slowdown across Europe and Japan. Against this backdrop, global equities, particularly domestic, enjoyed solid returns in the first quarter, with international equities echoing a similar risk-on bias despite fundamental headwinds. Performance across the fixed income landscape was equally impressive, as credit and rate-sensitive sectors alike posted positive returns. Real assets also shined, particularly those sectors sensitive to changes in energy prices. Over the trailing six-month period, developed market central banks have embarked on a policy reversal that has forced investors to grapple with the prospect of a sooner than expected end to the recent progress in returning to a more “normal” monetary policy. In early-March, the ECB surprised market participants by announcing new stimulus measures, including additional loans to the euro zone banking system and an extended pledge of the current ultra-low rate policy regime through at least the end of the year. The ECB also made meaningful downward revisions to their growth estimates for the region, with the central bank now expecting the economy to grow at an inflation-adjusted annualized pace of just 1.1% this year, down from the 1.7% estimate in December 2018. Euro zone economic fundamentals have witnessed significant deterioration since early 2018, particularly in the manufacturing sector, which slid deeper into “contraction” territory through March. As the ECB has shifted to become even more accommodative, the Fed has pivoted from a somewhat restrictive policy stance to one closer to neutral, with increased market-based signals that the transition from neutral to accommodative may come much sooner than initially anticipated. 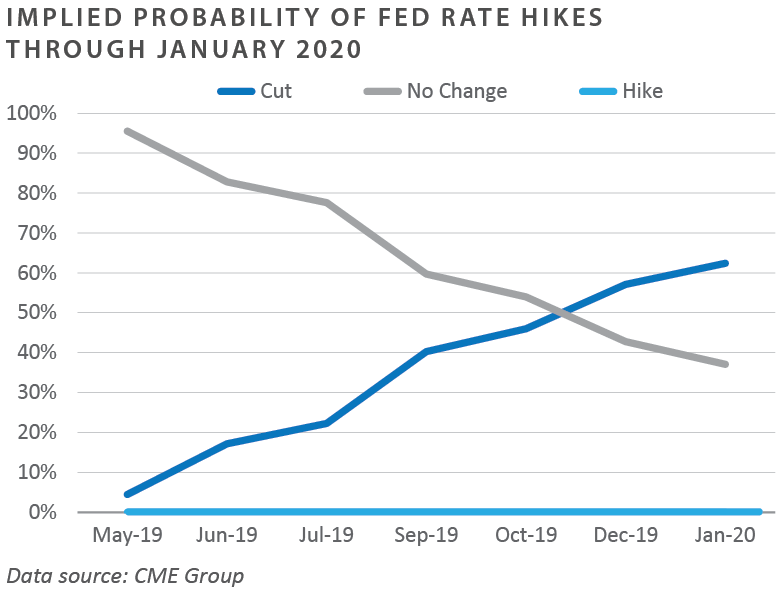 Fed funds futures, for example, now reflect a greater than 50% probability the Fed actually cuts interest rates before year-end, with Treasury futures market participants discounting the likelihood of a potential lowering of the federal funds rate at the Fed’s October meeting. Asset class performance in the first quarter reflected a seemingly “confused” marketplace, as asset classes and categories along the entire risk spectrum—ranging from risk-free Treasuries to ultra-risky small cap equity and below investment grade credit—handed investors healthy returns. The strong bid for risky assets likely reflects the expectation of easier near-term financial conditions brought on by renewed ECB stimulus and the potential for an end to the Fed’s tightening campaign. However, the rally taking place in the Treasury market, which helped send yields intra-quarter to the lowest level since December 2017, may be a signal that the ongoing economic expansion could be nearing stall speed. 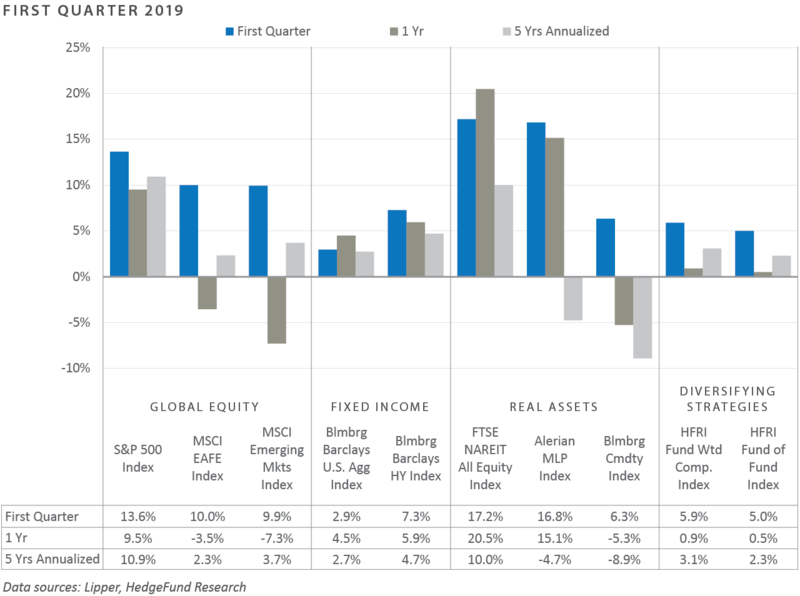 In summary, market performance was overwhelmingly positive in the first quarter of 2019, with what appeared to be indiscriminate investor demand for financial assets of all risk/return profiles. While troublesome global macroeconomic developments have surfaced—particularly in Europe—central monetary authorities have responded with promises of policy support, a reaction which has excited both bulls and bears. Equity markets rallied in the first quarter of 2019, signaling the return of investor confidence after a tumultuous end to 2018. The S&P 500 Index’s gain of 14% was the strongest quarter for the index since 2009 and the strongest first quarter in over 20 years. Every U.S. sector had a positive return in the quarter. The technology sector led following the fourth quarter’s retracement from lofty valuations and favorable earnings reports, both of which attracted investors. The health care and financials sectors lagged amid earnings impairments and weakness from headline pharmacy names while low interest rates took their toll on expectations for the earnings of financial institutions. The ECB's announcement of additional economic stimulus through continued negative interest rates helped overcome concerns of economic weakness across the continent and boosted risk assets. The United Kingdom continued to face difficulties surrounding a Brexit deal. Prime Minister Theresa May offered to step down if her plan was approved, but it was rejected for a third time. 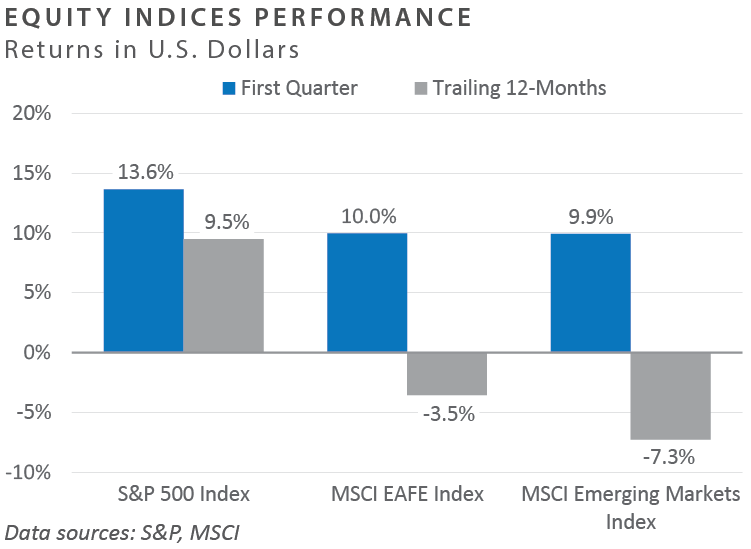 Emerging markets made up for their losses in 2018, returning 10% during the first quarter of 2019. Stimulus packages, economic reform, and decreased trade tensions between the United States and China helped support emerging markets stocks due to China’s large weight within the index. At the end of March, the U.S and China announced progress in their Beijing trade talks. The U.S. reported that the conversations were constructive and China continued to suspend additional tariffs on U.S. vehicles as a goodwill gesture. Major central banks across the world lowered growth expectations and shifted to more dovish policy during the first quarter. The Fed restated its commitment to being “patient,” reducing expectations of further rate hikes and signaling an earlier end to “quantitative tightening” than previously anticipated, announcing that the roll-off of the balance sheet would end in September, as opposed to the end of the year. Market expectations for a rate cut in 2019 rose to over 50%. Further commentary from Fed officials indicated that the central bank is re-evaluating the way it responds to inflation and may shift to an average inflation-targeting approach, thus targeting an average of 2% inflation over a given period versus at a given point of time. 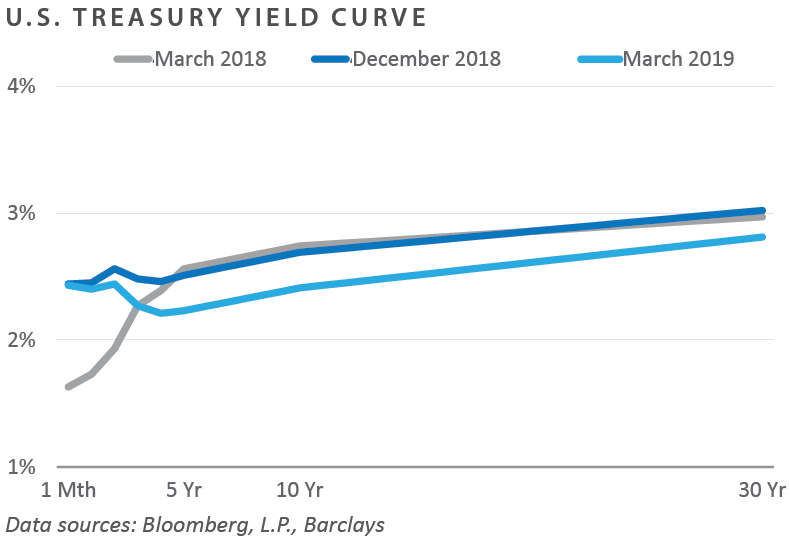 The yield curve inverted in mid-March, with 3-month Treasury securities out-yielding 10-year notes. This raised recessionary fears in the market, as the 10-year fell to a 14-month low of 2.3% following the Fed’s announcement to keep rates unchanged. However, the 2/10 spread, which is a more commonly used indicator of potential recession, remains positive, though it tightened to a low of 13 basis points (0.1%) during the quarter. Despite the uncertainty surrounding the yield curve inversion, lower quality securities outperformed their higher quality counterparts over the quarter, as risk assets rebounded following the flight-to-quality witnessed in December 2018. After widening in December, credit spreads retightened to start 2019, signaling a return of risk-on sentiment. U.S. REITs posted the strongest quarterly gain for all the major listed asset classes. The largest gains across the different REIT property sectors came from industrial, office, retail, and residential properties. Data center REITs also had strong gains in the first quarter, rising over 20%. The key demand drivers are still in place for nearly all types of commercial real estate, supported by the growth of net operating income and better fundamentals. Crude oil (WTI) rose 29.4% over the first quarter, reaching $61/barrel, the highest level in nearly five months. U.S. crude prices rose on positive signs for the global economy, tighter supplies, and improving demand. Positive manufacturing PMI data from China and the U.S. helped strengthen the demand outlook for crude products. Additionally, production cuts from the Organization of the Petroleum Exporting Countries (OPEC) and sanctions on Iran and Venezuela helped to prop up the price of crude oil. 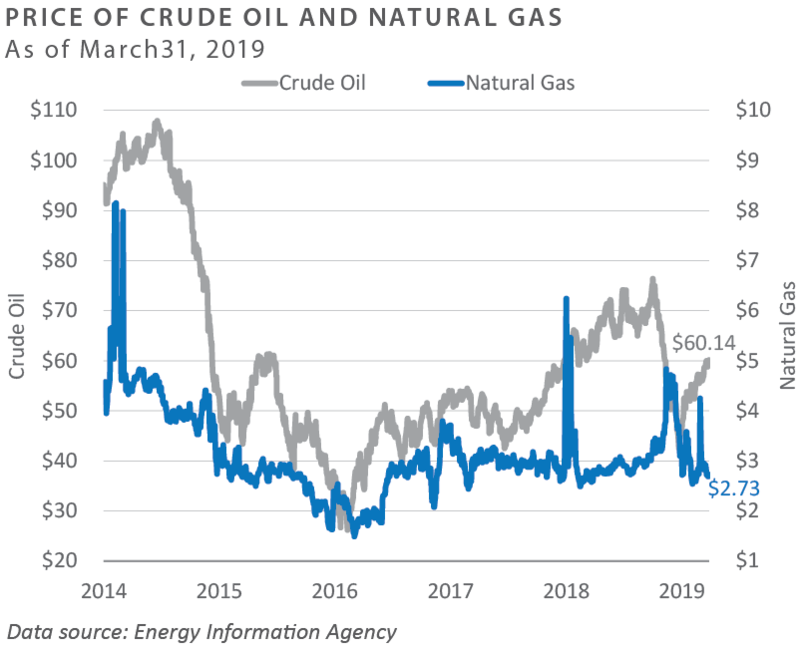 On the supply front, booming U.S. production has steadied, with domestic output currently around 11.9 million barrels per day. Commodity prices, as measured by the Dow Jones UBS Commodity Index, gained almost 7% in the first quarter of 2019. Petroleum prices were the standout driver of broad commodity index performance over the first three months of the year. Conversely, agricultural commodity prices put downward pressure on overall index performance. Industrial metals had strong gains in the first quarter on optimism over a U.S. trade deal with China. MLPs, as measured by the Alerian MLP Index, rallied almost 17% over the first quarter due to the run-up in crude oil prices, better performance of the broader energy sector, and new fund flows. Midstream management teams have been improving their operating models by increasingly focusing on capital discipline and self-funding growth with retained earnings. This has resulted in lower leverage, higher distribution growth, and more attractive valuations. The current yield on MLPs is around 8% and remains above the broad market benchmarks for high yield bonds (6.5%), emerging market bonds (6.2%), and investment grade bonds (4%). 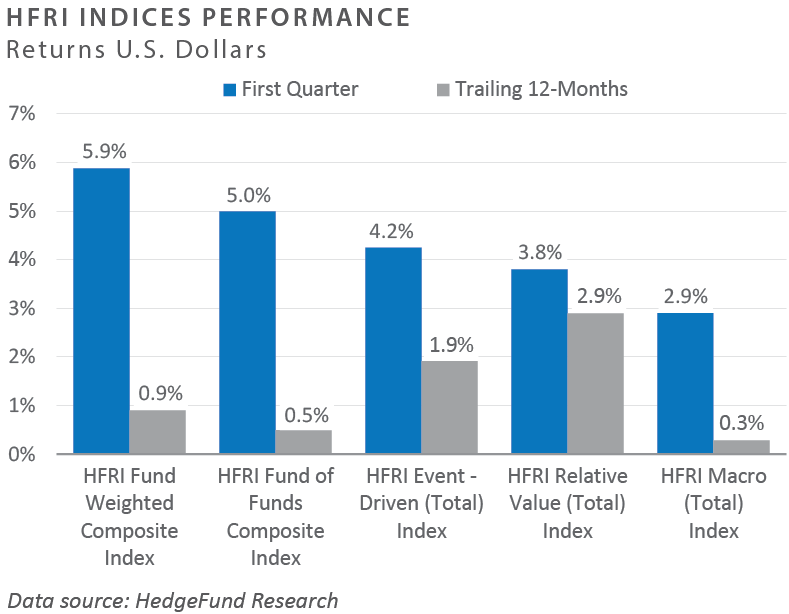 Event-driven strategies had a relatively strong first quarter of 2019. Positive performance was supported across sub-strategies including activism, special situations, merger arbitrage, and distressed investing. Merger arbitrage strategies witnessed a slight uptick in deal flow creating opportunities within the space. Within distressed credit, managers profited from idiosyncratic positions as catalysts began to unlock value as well as spread tightening in the high yield markets. Macro strategies enjoyed a strong start to the year. 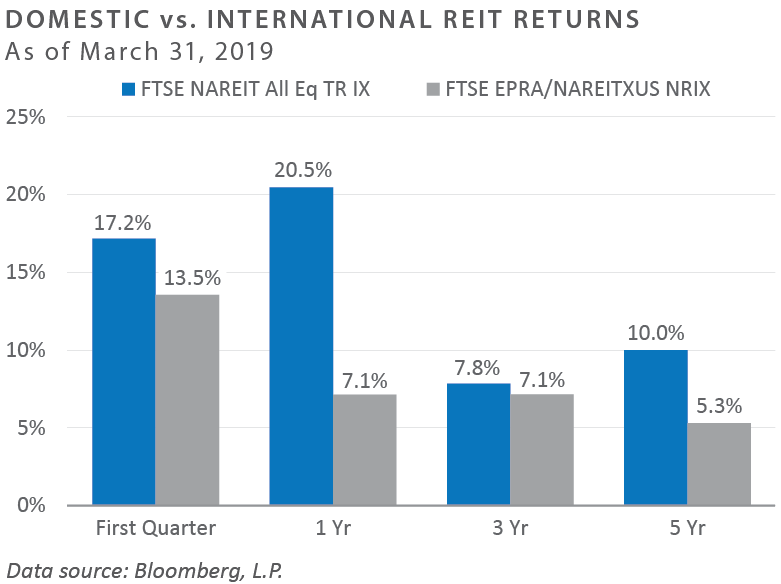 Systematic strategies posted gains in fixed income exposures as market rates declined and positions in emerging markets rebounded strongly in Asia amid hopes that a trade war would be averted. All data is as of March 31, 2019 unless otherwise noted. 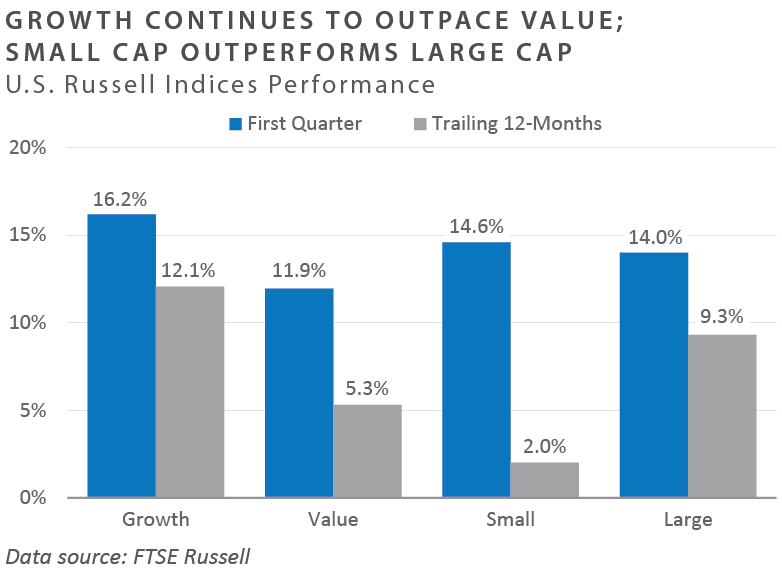 Russell Investments rank U.S. common stocks from largest to smallest market capitalization at each annual reconstitution period (May 31). The primary Russell Indices are defined as follows: 1) the top 3,000 stocks become the Russell 3000 Index, 2) the largest 1,000 stocks become the Russell 1000 Index, 3) the smallest 800 stocks in the Russell 1000 Index become the Russell Midcap index, 4) the next 2,000 stocks become the Russell 2000 Index, 5) the smallest 1,000 in the Russell 2000 Index plus the next smallest 1,000 comprise the Russell Microcap Index. See www.russell.com for more information. S&P 500 Index consists of 500 stocks chosen for market size, liquidity and industry group representation, among other factors by the S&P Index Committee, which is a team of analysts and economists at Standard and Poor's. The S&P 500 is a market-value weighted index, which means each stock’s weight in the index is proportionate to its market value and is designed to be a leading indicator of U.S. equities, and meant to reflect the risk/return characteristics of the large cap universe. See www.standardandpoors.com for more information.